As Winter draws in we all start spending more time indoors and looking to comfort foods to keep us warm. That's no different just because someone is a vegetarian, and cooking a main protein dish for someone who doesn't eat meat can be a daunting prospect for a carnivore. We've a split of 4 vegetarians and 4 meat-eaters in our household. After over 30 years as a veggie, more than 20 of those raising my own veggie kids, I've tried and failed with a good few dishes. 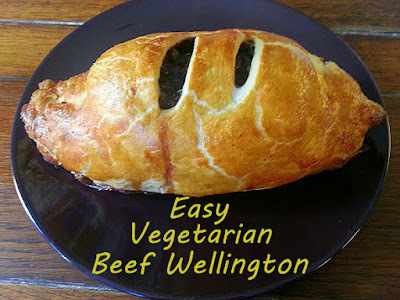 One dish which has proven consistently popular and makes everyone feel like I've gone to a lot of effort is the Vegetarian Beef Wellington. It's filling and tasty and a perfect veggie option whenever we go to the trouble to cook a joint of meat for the carnivores. A heck of a lot easier than it looks, this is fairly cheap to make, uses all the short cuts, has enough excitement that your vegetarians definitely won't feel like an afterthought, and is very easily adapted for vegans and people who don't eat Quorn. To my mind a Beef Wellington is special because although it presents as a type of pie, it has a solid mass of protein in the middle. Recreating that chunk of filling without the use of meat is what is important or you simply have a pasty or a pie. 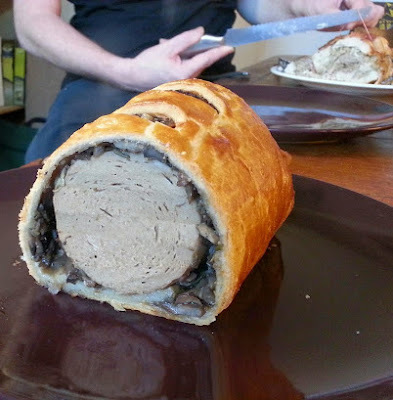 This uses a Frozen Quorn Meat Free Family Roast as the centre. Usually found in chicken style, if you can find it, get the Quorn Chef's Selection Roast Beef as it does work better. Shop bought ready made puff pastry 375g pack (it's almost always vegetarian, check the label). 5 vegetarian/vegan sausages of your choice or 1 pack sausage mix. Shop bought ready made puff pastry 375g (ALDI mark theirs 'vegetarian' when in fact it's vegan, check instore or online if you aren't sure). 1. Part cook your protein for the centre of your Wellington. Cook a Quorn Roast for around 40 minutes, and cook Quorn, tofu or soya sausages until they're just starting to brown. With sausage mix or sausages which are made from pressed vegetables, cook until ready, or they'll disintegrate inside the Wellington. 3. Remove the pastry from the fridge. 4. Lightly fry the chopped onion and sliced mushrooms until soft and releasing juices. Add the herbs, garlic, soy sauce and seasoning and fry (stirring/turning frequently) until there is no liquid sitting in the bottom of the pan. This may take 5-20 minutes depending on how much moisture there is in the mushrooms, onion and atmosphere! Switch off and set aside to cool. 5. Roll out the pastry 1 1/2 times as big as your protein - 1 1/2 times as long, and 1 1/2 times around. 6. Spread the slightly cooled mushroom mixture over the pastry, in a large enough rectangle to cover your protein. 7. 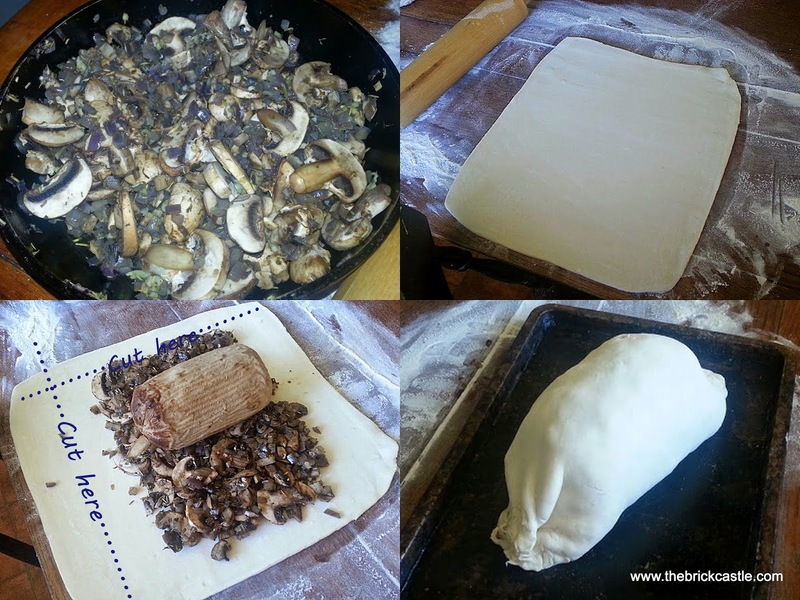 Place your protein on the mushroom mixture at the top edge of the pastry and roll the whole thing together like a sausage roll, sticking the last edge of the pastry to the roll with water. Dampen and pinch the ends together to seal them. 8. Brush with egg if cooking for a veggie (not for a vegan), and use a knife to cut 2 small slits in the top to let the steam escape. Cook until golden brown, around 30-40 minutes and eat as soon as you are ready. A special meal deserves something nice to drink, and ALDI sent us a sample from their Exquisite Collection of wines to try with our meal. Cabernet Sauvignon (£6.49) - The Limestone Coast Cabernet Sauvignon was slightly more heady than the pinot noir, with a deeper darker colour and flavour. A rounded wine that matched well with a Beef Wellington main course. Gavi (£5.49) - The Gavi was very drinkable and we felt had a lot of strong flavour. Not a soft fruity taste, a strident and slightly salty white wine that definitely suits the main course of a meal. Pinot Noir (£6.99) - The New Zealand Pinot Noir was quite light and fruity although not sweet. This, it was decided, would be the best of the 3 to go with a dessert, although also suited a main. A match for cheese, chocolate or fruit to complete your meal. 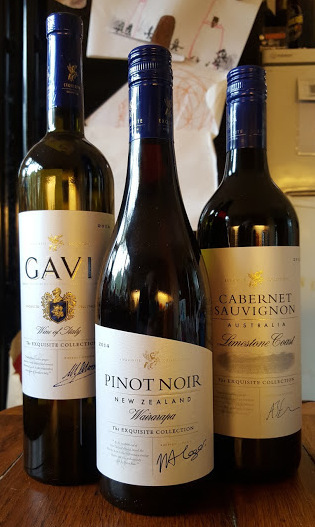 These wines are NOT vegan, although ALDI sell around 20 vegan own-brand bottled wines, starting at under £5 a bottle and including everything from Sauvignon Blanc and Pink Champagne to Specially Selected Valpolicella Ripasso and Côtes du Rhône. Here is the latest PDF list of vegan products from ALDI. (Thanks to The Vegan Womble for that - it's quite well hidden). Mmm, never thought of wrapping a Quorn roast in pastry before, will have to try that although have to say we've never had the beef one either, only seen the chicken one in store. The wines sound lovely to go with it too. This looks yummy. 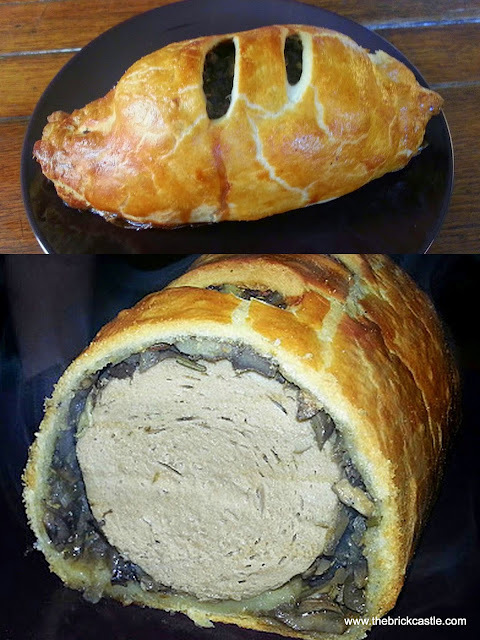 I've never been brave enough to make a beef wellington, might give it a go now. Wow! This beef Wellington look amazing! Yum yum. I eat lots of Quron but havent come across the Quorn Meat Free Family Roast -where can I get it?